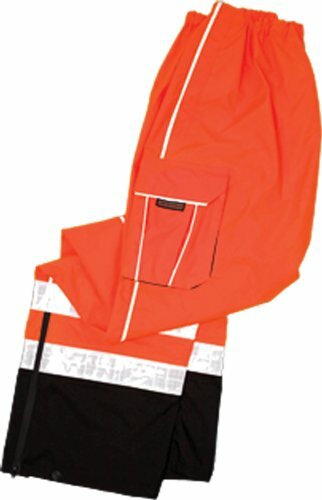 ML Kishigo Brilliant series rainwear High-Viz pant. The Brilliant series rainwear pants are the obvious companion to the stylish and functional rainwear jacket. This combination is sure to keep you dry and visible both day and night in even the harshest weather. Reflective trim down the outside of the legs for enhanced low light visibility. Adjustable leg cuff straps. Zipper cuff for boot access. Large left and right side gusseted cargo pockets with reflective trim. ANSI/ISEA 107 class E compliant. Size: large and extra large. Orange color.